Real Estate for Rehabilitation is the homeownership industry's chance to transform lives in partnership with The Salvation Army. Realtors and title companies refer clients to The Salvation Army when a client is making a transition in their life –from one home to another. During this time of change, homebuyers often find that they have clothing, furniture, and other household goods that they wish to donate. The Salvation Army builds relationships with realtors and title companies. The Salvation Army becomes an asset to realtors, title companies, and homebuyers who need an outlet for their donated goods. 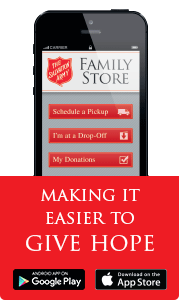 The Salvation Army provides business cards, brochures, and other collateral as needed to advertise the partnership. Homebuyers call 1-800-SA-TRUCK or visit www.satruck.org to schedule a pickup or find a drop off location. For more information please visit www.realestateforrehabilitation.com.